Emergency powers will give Mr Gusmao control of the army and police, split by internal disputes and gang violence. Mr Gusmao said the move is to "prevent violence and avoid further fatalities", as well as for the "rapid reestablishment of public order". The intervention of the president, who normally plays a largely symbolic role, will be widely welcomed, the BBC's Jonathan Head says. But he alone cannot fix the collapse of East Timor's system of government. Mr Alkatiri is deeply unpopular but refuses to resign and there are few obvious successors to him, our correspondent says. There are reports that the defence and interior ministers have been sacked, but it is not clear yet whether they have accepted this. Mr Gusmao's move follows days of mounting tension and violence. At least 20 people are reported to have been killed and tens of thousands have fled their homes. 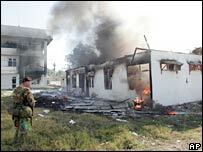 More violence on Tuesday left several shops - once part of a vibrant commercial district - reduced to burnt out shells. Many people, including children, were simply helping themselves to supplies. In some houses anything of value has been stripped away or destroyed. Many residents have taken shelter at makeshift camps where basic necessities are running out. Thousands of desperate people descended on warehouses where rice was being handed out, and waited for hours in the baking sun. The immediate cause of the violence was the sacking of 600 striking soldiers in March. The soldiers, who were mainly from the west of the country, complained of discrimination against them by leaders from the east. But there are also signs that some of the violence is politically motivated. Attorney-General Longuinhos Monteiro told the BBC his offices had been looted on several occasions and up to 15% of the criminal archive stolen. Some of the stolen files relate to Indonesia's bloody withdrawal from East Timor following a 1999 referendum. Pro-Indonesian militias were accused of orchestrating the violence, which left more than 1,000 people dead. Australian Brigadier Michael Slater says his 1,300 peacekeeping troops are gaining an upper hand against the gangs of "gutless thugs" rampaging in Dili. "We've been taking the weapons off them and they are losing their freedom of action because we have so many soldiers out there providing the security among the population," he told the Australian media. "It's not fixed, but we're getting there," he added. He went on to say that although there were "some very large groups of internally displaced people", but "there is no humanitarian crisis here".